Alice and the Mad Tea Party Slots 5 out of 5 based on 4 ratings. 4 user reviews. 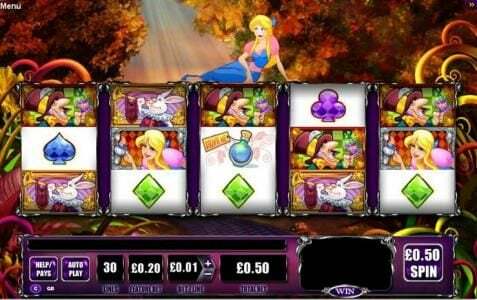 Alice in Wonderland is a progressive video slot offered by wms. It includes 5 reels, 30 paylines, scatters symbols, wilds symbols and a bonus game. 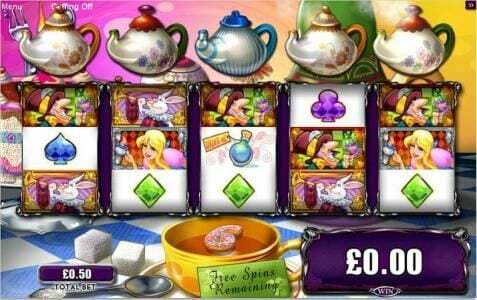 The theme of this video slot is based around the classic childhood classic of Alice in Wonderland. It includes many references such as the symbols found within the game and the magical appearance of wonder in the background. As you enter the world of Wonderland you are greeted with many fine features. The graphics are nice and give you a simple, yet well-presented symbol that will have you revelling in the memories of child hood night time stories. 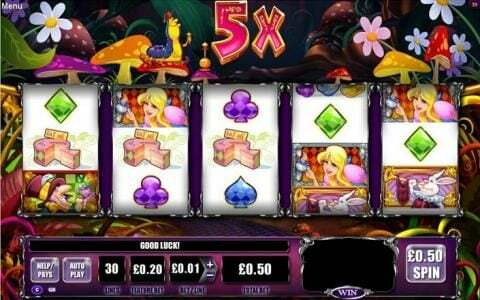 The symbols are what really make this video slot a magical thing as they included Alice, the rabbit, the mean step mother and the toad. The reels are complimented with the usual mix of numbers and letter symbols. The game includes some feature symbols like the twins, the mad hatter and the cat. All of the symbols offer additional animation whenever found in a winning combination and will include sounds that are reminiscent to that you would hear from the movie of the same name. The minimum wager in Alice in Wonderland is £0.25 per line and the maximum is £50.00 per line. This means the minimum wager is £5.00 per spin and the maximum is £1,000 per spin. This is especially attractive for those who are high rollers and are looking for a Slot that will permit them to wager large amount per spin. You are able to use an autoplay features for up to 25 spins. The first feature you will come across in Alice in Wonderland is the wild symbol. This can appear on any of the five reels and will multiple any winning combinations by as much as 10 times. 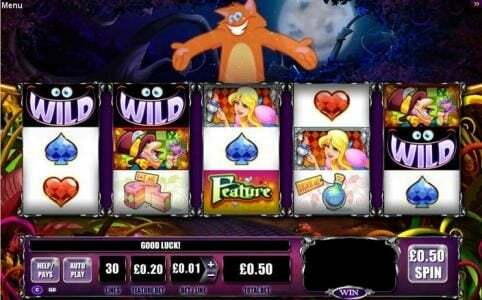 Included are sticky wilds as well which can see multiple positions on the reels turned wild through an interactive bunny bouncing across the screen. The scatter symbol is your pathway to the free spins. Whenever three or more appear on the reels you will win a scatter award that starts at two times your wager and will increase up to 10 times your wager if five scatters appear. It will also award you with free spins! The bonus game is awarded when three of the twin symbols appear on the reels. This will take you off to a magical Bonus game called the Tea Party. You will choose who is to be the guest for the tea party and based on how much they drink you will win cash reward. 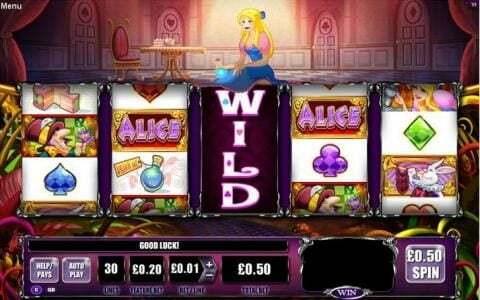 You may even find yourself winning one of the two available progressive jackpots that is offered in Alice in Wonderland. This is a fun game that brings back childhood memories. Be sure t go visit Alice and all her friends today! You will be glad you did! Alot of fun and bonuses!!!! I love this slot, it has alot of different features that other slot games dont have. So you have more chances of winning money. You never know when, some just pop up randomly. It keeps your attention with all the different features, therefore, you play longer. This game is super fun! We have it at the local casino and I played one time and didnt get any of the bonuses, so I really didnt get to experience it, but I loved it!